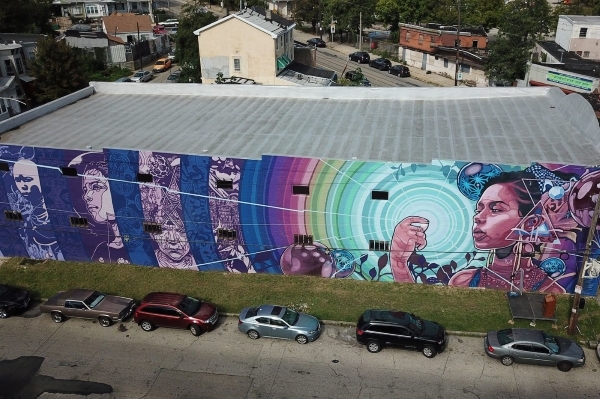 Mural Arts Philadelphia is bringing art to life with the city’s first augmented-reality mural, Dreams, Diaspora, and Destiny. The project invites viewers to experience a large-scale painting completed on a warehouse at 53rd and Media Streets through the lens of a smartphone app that casts holograms and generates a changing soundtrack as you move from left to right. Picture a metaphysical version of Pokémon Go in which the power of a screen momentarily alters reality around you. To see the augmented reality, point your phone screen at the mural. Immediately, elements such as light beams, colorful orbs, floating crystals, and sculpturelike figures will begin to pop out from the painting, covering a wall the length of a city block. You can start your AR experience at any point along the mural, but it’s best to begin at the left side, where the story of the mural begins. The project is part of Mural Arts Month, running through October as a celebration of Mural Arts Philadelphia. Other works of art, including an interactive, inflatable You Are Magic pop-up sculpture, will be presented at Aviator Park on Oct. 26, and events including a storytelling workshop, a town hall to encourage civic discourse, and mural dedications will be held. With the yearlong Dreams, Diaspora, and Destiny project, Mays and Britt set out to visualize possible futures for West Philadelphia, involving students from Mastery Shoemaker Charter School, across the street from the mural, as well as from the Haverford School. The collaboration marks the first Mural Arts Philadelphia partnership to connect public and private high school students. Thinking about the destiny of West Philadelphia, the students dreamed up imagery ranging from an undersea world full of squids and water spirits to a landscape where robots intermingle with humans in everyday life. Including the students’ ideas in his design, Mays developed a progressive series of abstract images that start with a representation of the African diaspora and end with a portrait of a woman holding a shining seed between her fingers, the focal point of the mural. “The seed is meant to unveil a world of future possibilities, radiating out to a past that reconnects the main character with her ancestral heritage,” Mays says. Between the first and the last sections of the painting, viewers can find influences of the 1960s and ’70s era of jazz in America, as well as futuristic-styled sequences, including prisms, orbs, and the face of a man resembling an android. The audio component, which you can hear through the app, follows the temporal transition of the painting. Drums, chants, and other tribal percussion notes mark the beginning, shifting to trumpet and electric piano tunes inspired by ’70s jazz, and ending with rhythmic, hip-hop-inspired beats mixed with futuristic sounds. “At the end, you’ll hear lots of sci-fi-style noises, with trippy, electronic notes and laser sounds meant to represent far into the future,” says Britt, who compared the composing process to scoring music for a video game. Some of the audio comes from sounds made by students that Britt captured while visiting the Mastery Shoemaker. Britt also incorporated snippets from interviews conducted with three neighborhood elders. Through the Dreams, Diaspora, and Destiny smartphone app, the stories of the community come to life as sculptural figures emerge on the screen, shifting the soundtrack from music to spoken word. The app is expected to be available indefinitely, or for as long as the mural remains.